This is the collected edition of my four-part review from last month of the Madrid Tintoretto show. Everything is now here, in one place, for you reading leisure, and – hopefully – pleasure. As I wrote back when I was in Madrid, I found the exhibition a little underwhelming, overall. Which is perfectly natural I suppose; putting together a retrospective on Tintoretto is a rather thankless task because more or less all the best work is unavailable, tied as it is to its locations in the Venetian churches, public buildings and the Accademia. Probably the main reason why no one has attempted it since 1937. Compounding the problem in this case is the fact that the Prado houses one of the most amazing collections of European painting in the world. When adjacent galleries display some of the best work of painters such as Titian, El Greco, Rubens, Velazquez and Goya, only the rare exhibition is not naturally upstaged. On the other hand, Tintoretto is Tintoretto, and the exhibition had no shortage of interesting work to look at. As is often the case with retrospectives, it provided a singular chance to compare, assess and discover. Especially since the works were displayed in the long central gallery of the museum, one of the great display spaces for art in Europe, where they could be seen up close and in natural light. And as such it was a great show. The exhibition was accompanied by a lavish catalogue, edited by curator Miguel Falomir, with important legwork on chronology and attribution provided by Robert Echols and Frederick Ilchman, informative entries, generally good reproductions and a very helpful compendium of documents in the back. The first new finding that struck me (and probably a lot of scholars) was the discovery of the document that cast new light on Jacopo Tintoretto’s (c. 1519-1594) family. 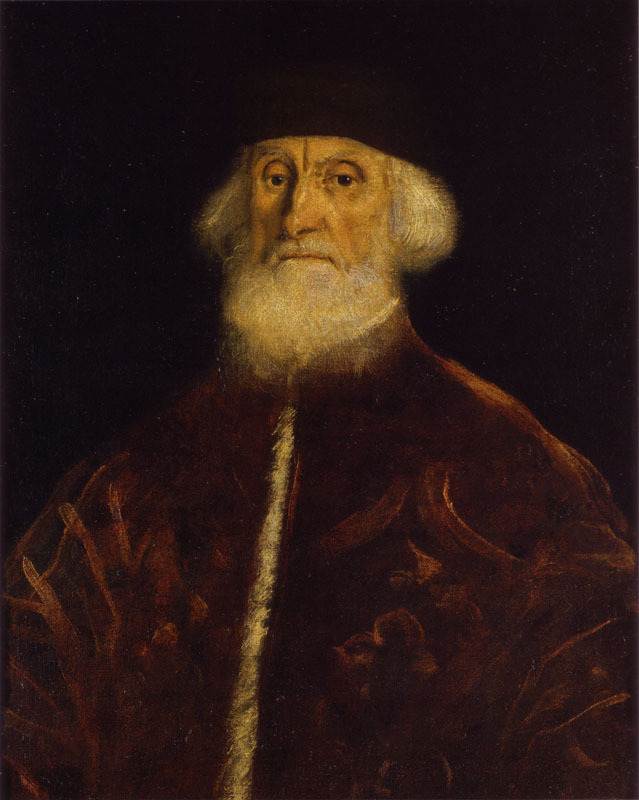 It turns out that what has generally been understood as his family name ‘Robusti’ was actually a nickname bestowed upon his father and uncle for their steadfast effort in the defense of Padua against Imperial troops in 1509. Additional research carried out in connection with the exhibition has tended to verify this account and the real name of the family, Comin. 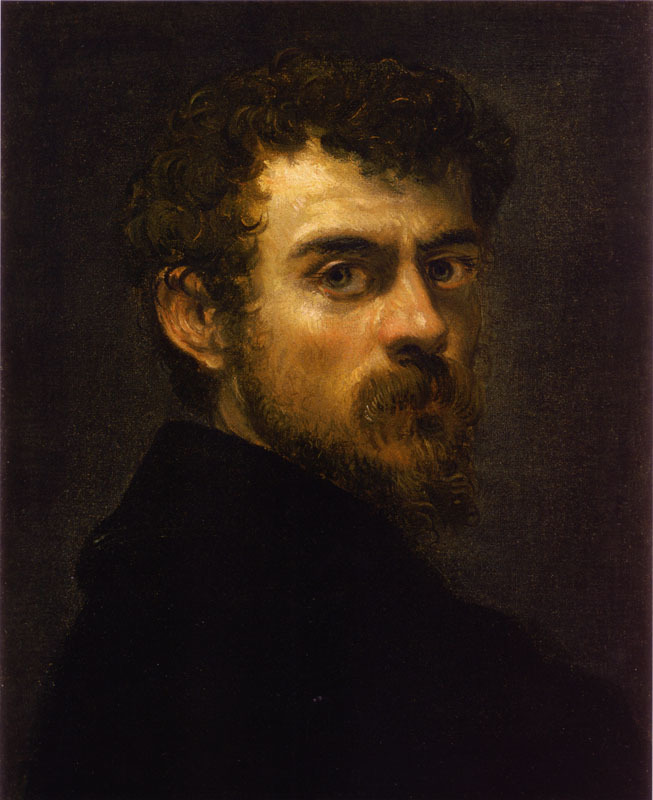 Also, the National Gallery’s Jill Dunkerton has, as always, produced a thoroughly informative and useful article on Tintoretto’s technique. At the occasion of the opening, a conference involving many of the world’s premier Tintoretto scholars was held, the results of which will be published later and is surely going to be a must-read. A thoroughly astonishing testament to the young Tintoretto’s ambition, this painting serves it up frantic. Anticipating a lot of the work he would go on to do, it is almost bursting at the seams with painterly enthusiasm. 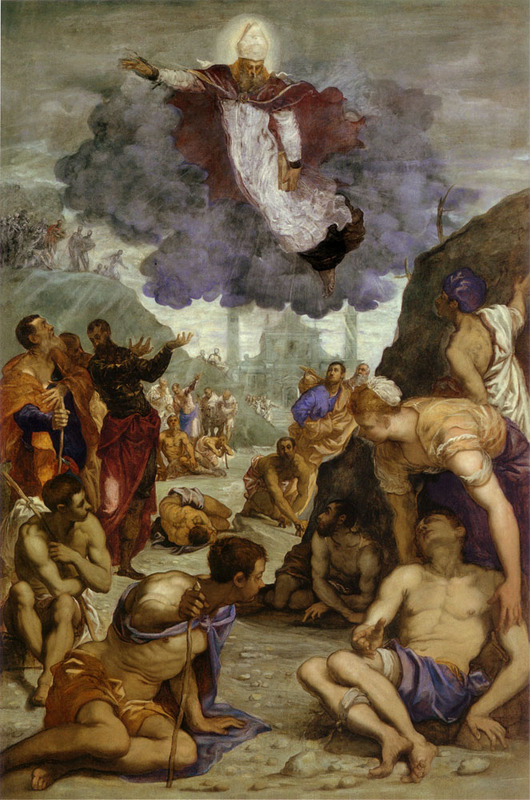 As the quickly blocked-in, stylized receding columns attest, Tintoretto was clearly impatient with the nuts and bolts of perspectival rendering and the space suggested by the perspective of the composition is indeed not fully convincing – how far away from us, exactly, is the young Christ? – but it is deliriously effective, bringing figures ostensibly far from each other into seemingly close proximity, as if shot through a telephoto lens. It makes giants of the foreground figures, handling these enormous, almost animated books that seem to be struggling against the laws of perspectival foreshortening. Their gestures are animated to the point of exaggeration. The hunched man leafing through his book in the foreground is an evocative depiction of intellectual involvement, while the one reclining on the stairs eagerly trying to get Christ’s attention with what appears to be a troubling point is delightful. Also, the hand disappearing awkwardly behind the head of the seated man on the far right is one of those details that gives the picture is crackling energy, and of course the latter figure has to point his foot at us. Nothing like a little foreshortening to demonstrate that you mean business. Another fascinating composition, in this case of a rather obscure subject: Saint Augustine appearing to, and healing, forty cripples on a pilgrimage to Rome, as told in the Golden Legend. 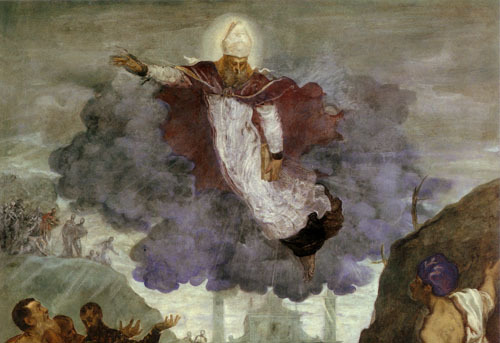 Tintoretto has Augustine suspended in the air – why should he be walking? – emerging from a vigorous puff of cumulus. The grand figures strewn about in recession is a strong pictorial invention, and the elongated, ephemeral body of the saint with his translucent cover of white that looks as if it were shaving foam applied with a soft brush is a joy. But most of all, there is the colour – the basic tone of richly luminous greyish blue, on which the utterly remarkable purplish puff discharges. Proof, if anything is, of Tintoretto’s at times astonishing acuity as a colourist. 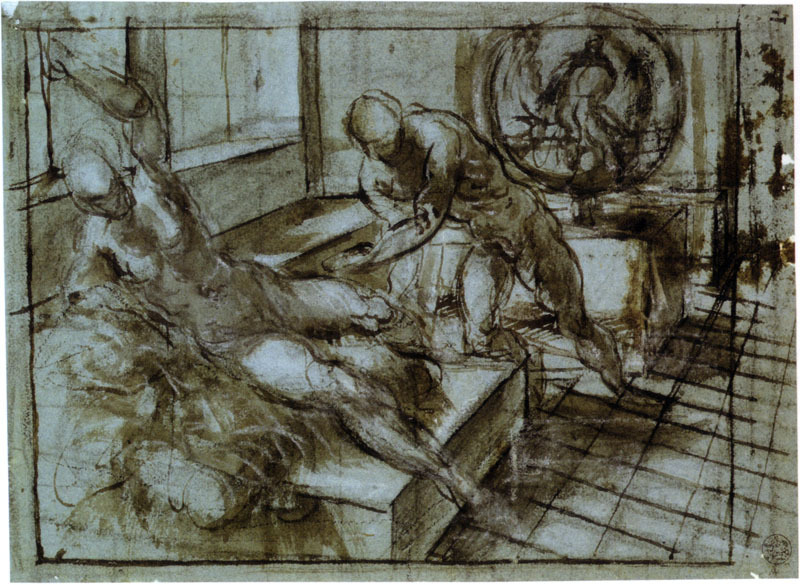 The exhibition included a small section devoted to drawings, small canvases, oil sketches, x-rays and the like in order to give a sense of practice and process in Tintoretto’s studio. It was all very illuminating, despite two of his famous studies of Michelangelo’s Samson and the Two Philistines being terribly displayed in a dark trough-like box. Anyway, let me here focus on a couple of preparative studies and the received wisdom about them. First up is the study for the Munich Venus and Mars surprised by Vulcan (c. 1545), also in the exhibition. Carlo Ridolfi, who wrote the most extensive historical biography on Tintoretto in 1642 mentions how Tintoretto would arrange small figurines in miniature sets and experiment with positioning, lighting, etc. in order to develop many of his compositions. 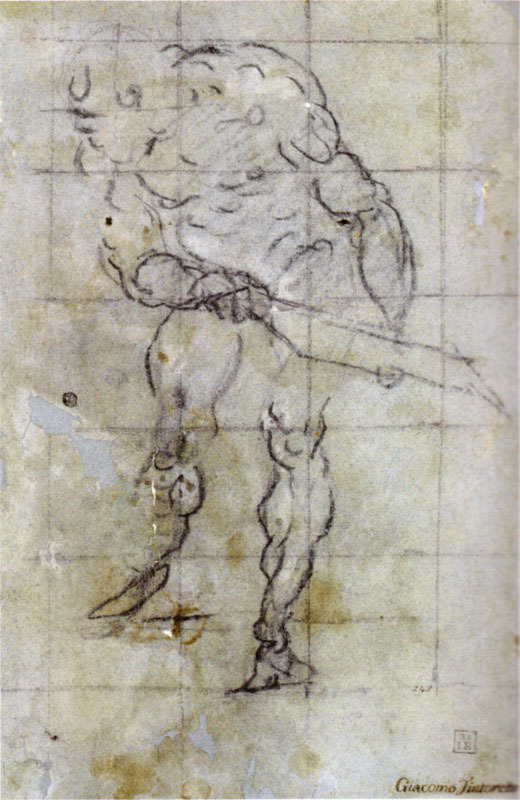 The only extant drawing of its kind, this sheet has been taken as evidence of such an approach. Given the very subtle lighting, this may just be true, but I would still suggest some care of judgment here. 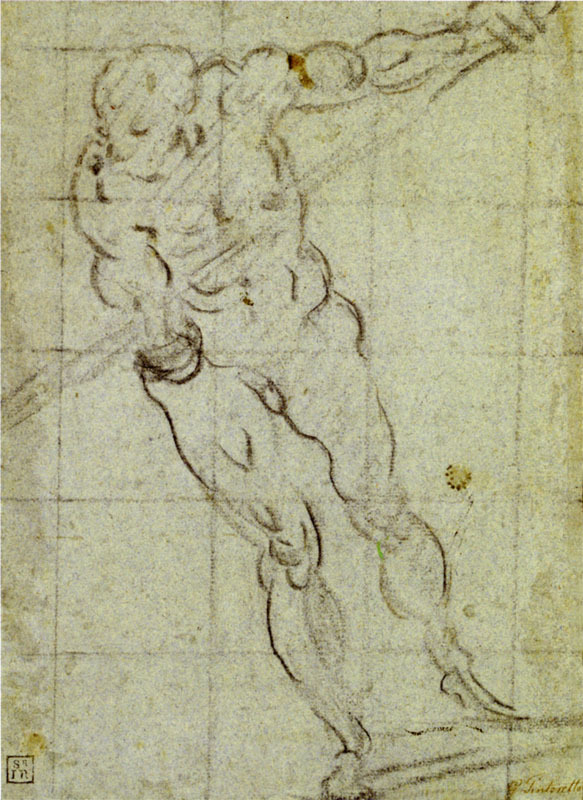 This is a vigorously composed drawing, with the perspective lines laid in freehand. Why would as accomplished a draughtsman as Tintoretto need small mannequins for this? Similarly, received wisdom appears to hold that most of the figure studies for his paintings, of which there were a handful of examples in the show, are drawn after either figurines or live models. 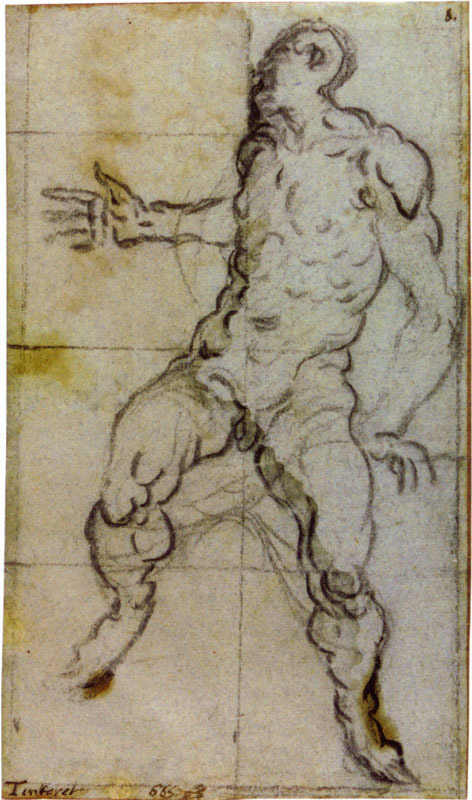 This might be the case for some of them – a figure study for the Theft of the Body of Saint Mark (painted in 1562-66 for the Scuola di San Marco, now in Milan) could for example very likely have been drawn after a mannequin hung from a rafter or something like that. And in both the sign and the catalogue, it is pointed out how lines through the hand of a male figure used for the Madonna dell’Orto Casting of the Golden Calf (c. 1559-60) stem from a pole the model was ostensibly holding on to. The former I am ready to accept, the latter I am not so sure about. 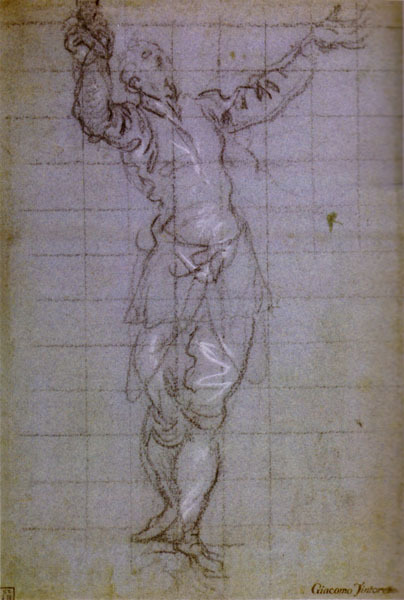 Watching the confidence with which Tintoretto puts down his wavy contours, constructing his figures curve by curve, a figure like the latter could just as well have been done freehand. Two studies for a Martyrdom of Saint Lawrence (1578-80) included in the show are, I think, examples of this. At one and the same time so loose and so controlled, these figures are surely inventions made on paper with no visual aid. Their expressiveness is of the kind one creates while improvising figures in line. The common art historical notion that everything must have been done according a prototype or through the use of some kind of mechanical aid or the like is one we need to regard with strong skepticism. 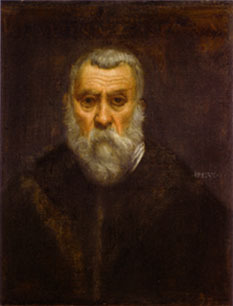 One of the worthy subsidiary objectives of curator Miguel Falomir for the exhibition seems to have been the rehabilitation of Tintoretto as a portraitist. His portraiture has traditionally been disparaged by scholars and amateurs alike, and not always entirely justly. Sharing the stage with one of the greatest portraitists of all, Titian, has of course not made things easier, as portraiture remains the one genre in which he never succeeded in exorcising the dominance of the older paragon and providing a fully convincing alternative. One problem is probably that the portrait by nature did not offer Tintoretto as much of a venue in which to exercise his gift for dramatic mise-en-scène and that his efforts in portraiture are therefore measured more according to its psychological insight and quality of execution. In terms of the latter, Tintoretto is definitely more impressive when he has a large canvas to unleash on. The smaller scale of his portraits still provide ample ground for billowing waves of facial hair, as seen in the marvelous early Self-portrait (c. 1546-7), and dashing highlights along the sleeves of such sitters as the Washington Procurator of St. Mark’s (c. 1570), and the animation of posture so central to his figure compositions is often retained to an extent in the portraits, many of which are characterized by sitters in mid-speech, -gesture or -motion. However, in terms of sheer sensual pleasure, of the lingering joy of painterly texture, his portraits are a far cry from a Titian or a Veronese’s. Concerning the former, however, his best portraits do evince a unique sensibility that it would be a shame to ignore. There is a rare softness to his depictions of people. With slightly liquid eyes, benign of gaze. 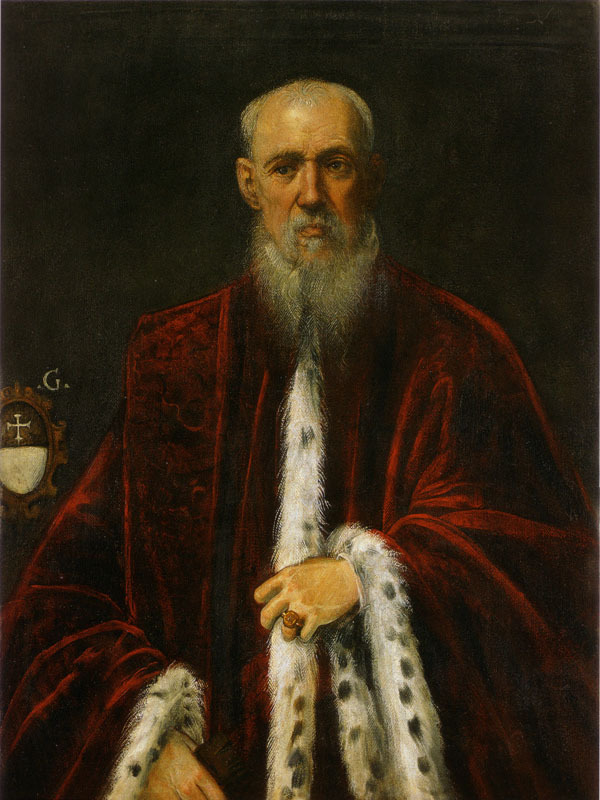 This is immediately apparent in the friendly gesture of the man who may be Agostino Doria (c. 1555), the intelligent face of the octogenarian Jacopo Soranzo (c. 1550), and even in the shrewd over-the-shoulder glance of the Prado’s own Man with a Golden Chain (c. 1555). 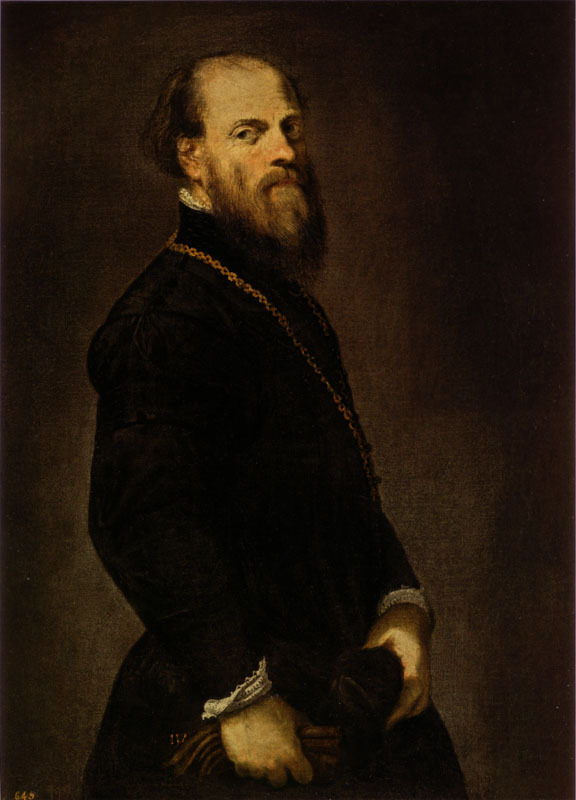 I kind of missed the National Gallery picture of Vincenzo Morosini (c. 1580), which epitomizes the sensitive qualities of Tintoretto’s portraiture, but you cannot have everything. What I do not understand, however, is the inclusion of the late portrait of Alessandro Gritti (c. 1581-82). While the sitter’s expression is not uninteresting, the colours are gaudy and the execution is flat, unappealing and not at all up to the standard of the other included portraits. Some of this may be due to insensitive restoration, but it at least made this viewer at least wonder whether it is by Jacopo at all. This is exacerbated by the comparison, in the catalogue as well as on the wall in the gallery, to the justly famous late Self-portrait c. 1588) – a searingly spiritual look of life. Reunited for the first time in over 400 years with the Last Supper painted for the same institution, the San Marcuola Scuola del Santissimo Sacramento, a few years earlier (in 1547), the Prado’s own Washing of the Feet formed the natural centerpiece of the exhibition. The paintings have long been thought to have been conceived as pendants, hung opposite each other in the chapel, but the curators clearly rightly maintained that they were meant for two different locations in the scuola. The long-held view that the San Marcuola Last Supper marked an important artistic breakthrough for Tintoretto seems emphatically proven by the juxtaposition. It is simply astonishing to see how much Tintoretto developed as a painter in the year or so separating the two canvases. The earlier painting is a rather awkward, boxed-in affair, while the Washing of the Feet is one of the most evocative renderings of three-dimensional space in Renaissance painting. 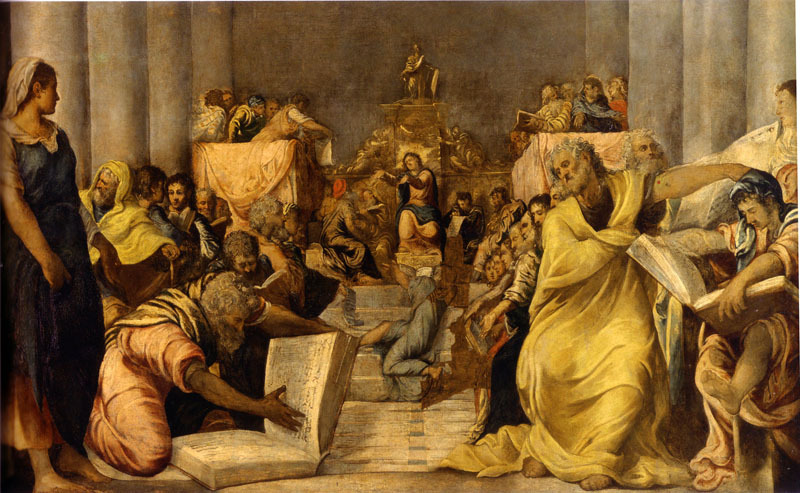 It is not simply that he has constructed his deep lateral perspective correctly, or that his famous quotations from Sebastiano Serlio’s book of theater set designs lend to the composition an exalted grandeur, but rather the very palpable sense of moved-in space Tintoretto here achieves. The placement of the figures – syncopated to the architecture’s rhythm – across the widescreen canvas, as well as in depth is key. The eye is encouraged to wander between them, and eventually trace the movement Christ has made through the hall, across the floor to the spot at the extreme right where he is now kneeling, with his apron fixed around his waist and his sleeves rolled up for the task at hand. There is both humor and solemnity to the proceedings; the quietness of the serpentine figure at the far left contrasted seemingly exertive removal of stockings in the centre, tempered by the absent minded glance of the blue-clad apostle looking at his standing companion as he performing the opposite operation. Some of the Apostles converse, while others are lost in thought. It is all eminently natural. The remarkably rustic quality of their garments and the rough furniture the figures are clustered around add further materiality to the otherwise airily exalted space surrounding them. It is a brilliantly conceived contrast, achieved through lightness of colour as well as touch. The chimerical view upon the future supper through the dark doorway on the right completes the feeling of an otherworldly space for this touching physical scene of charity. As x-ray photography reveals, Tintoretto ingeniously substituted the original, square-tiled floor for the final pattern of octagons and squares. The visual effect of this is extraordinary. When seen laterally, the tiling surges away into the background, but as you move along it seems to contract, giving the feeling of being drawn into the composition, becoming company, being invited to follow in the footsteps of Christ. To read the original installments: part I, part II, part III and part IV. Apologies for the piss-poor image of the Washing of the Feet. It’s hard finding one that isn’t either in black and white, or goes across the spine of the book. Argh!